Download "1.3 The policy applies to all students including full and part-time, undergraduate, postgraduate, home and overseas students." 1 1. Introduction 1.1 This document sets out the policy of the University in relation to student accommodation debt, along with the debt management procedures that will be followed in relation to this type of debt. 1.2 The University has many sources of income, which are collected by different methods. This policy specifically covers the collection of fees and charges payable to the University by current and former students in relation to accommodation fees. 1.3 The policy applies to all students including full and part-time, undergraduate, postgraduate, home and overseas students. 1.4 The Policy is designed to ensure that all students are treated in a fair and equitable manner. 1.5 The aim of the policy is to minimise levels of student accommodation debt, and of bad debts, in order to protect the overall financial health of the University and to allow it to continue to invest in teaching and research excellence. 1.6 The Accommodation Operations Manager and the Accounts Receivable Manager of Finance are responsible for reviewing this policy; Finance and Accommodation staffs are responsible for the effective operation of accommodation debt management procedures; all staff are expected to be familiar with this policy and to contribute to its effective implementation 2. Support to Students 2.1 In applying the policy, the University will at all times seek to be sympathetic to, and understanding of, individual students financial circumstances. However, for the University to do so, students must engage in dialogue with the University if they are experiencing difficulties. 2.2 Action to enforce settlement of debt for outstanding accommodation fees and charges may be taken against all current and former students who have failed to engage with the University to find a solution to settle any outstanding debt and who have failed to honour agreements to pay. 2.3 Students experiencing difficulties in paying any fees and charges should seek help at the earliest opportunity through: Making contact with Accommodation Services Accommodation staff can be contacted by various means. E:vision help desk Telephone: Appointments can also be made to meet Accommodation Services staff to discuss any accommodation fee related issues. 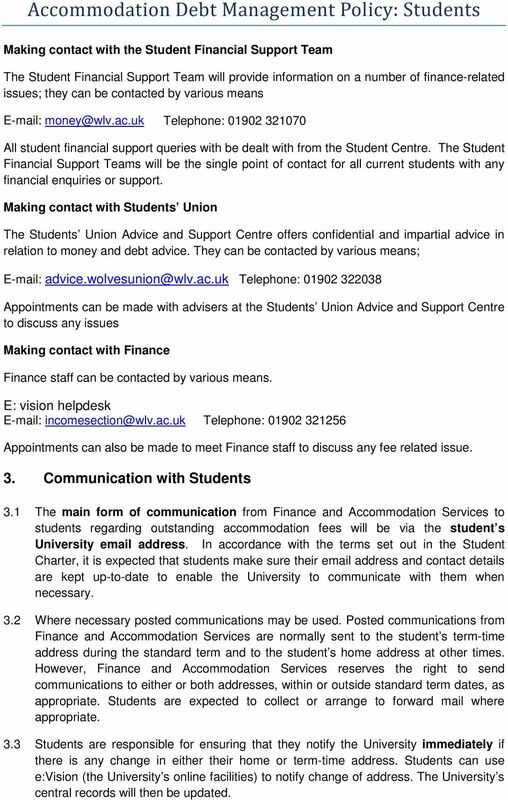 2 Making contact with the Student Financial Support Team The Student Financial Support Team will provide information on a number of finance-related issues; they can be contacted by various means Telephone: All student financial support queries with be dealt with from the Student Centre. The Student Financial Support Teams will be the single point of contact for all current students with any financial enquiries or support. Making contact with Students Union The Students Union Advice and Support Centre offers confidential and impartial advice in relation to money and debt advice. They can be contacted by various means; Telephone: Appointments can be made with advisers at the Students Union Advice and Support Centre to discuss any issues Making contact with Finance Finance staff can be contacted by various means. E: vision helpdesk Telephone: Appointments can also be made to meet Finance staff to discuss any fee related issue. 3. Communication with Students 3.1 The main form of communication from Finance and Accommodation Services to students regarding outstanding accommodation fees will be via the student s University address. In accordance with the terms set out in the Student Charter, it is expected that students make sure their address and contact details are kept up-to-date to enable the University to communicate with them when necessary. 3.2 Where necessary posted communications may be used. Posted communications from Finance and Accommodation Services are normally sent to the student s term-time address during the standard term and to the student s home address at other times. However, Finance and Accommodation Services reserves the right to send communications to either or both addresses, within or outside standard term dates, as appropriate. Students are expected to collect or arrange to forward mail where appropriate. 3.3 Students are responsible for ensuring that they notify the University immediately if there is any change in either their home or term-time address. Students can use e:vision (the University s online facilities) to notify change of address. The University s central records will then be updated. 3 3.4 Accommodation Services will undertake campaigns to raise awareness to students not to ignore their debts and where to seek help and support if they are in a financial predicament. Information and guidance will also be placed on the Accommodation Services web pages for September intake. 4. Fees: Key Points to Note 4.1 Students are personally responsible for ensuring that all accommodation fees, fines and other charges are paid. In accepting the offer of accommodation, the student accepts a contractual liability to pay the accommodation fee, fines and other charges on time. 4.2 If the student has an accommodation debt and makes a payment, this will be applied against the oldest accommodation debt first. 4.3 In accordance with University Bye Laws, Students will not be able to move into the next year of study with any debt outstanding and this includes accommodation debt. 4.4 Students will be able to graduate with accommodation debt but will not be able to attend a graduation ceremony with outstanding debt. 5. Accommodation Fees 5.1 Full details on how to pay Accommodation Fees can be found on the Accommodation Services website in the section How and When to Pay. 5.2 Accommodation offered by the University is dependent on the student signing a Licence Agreement for the period of accommodation and paying a rent prepayment (the accommodation rent prepayment is currently ). The rent prepayment will be deducted from the sum on the final payment due date. 5.3 The Licence Agreement is a legally binding document. Breach of any of the conditions of the Licence Agreement may result in the University seeking recovery of possession of the accommodation from the student through a Notice to Quit. 5.4 The University has the right to refuse an application for accommodation from a returning student if the University deems they have a poor payment record for accommodation fees. 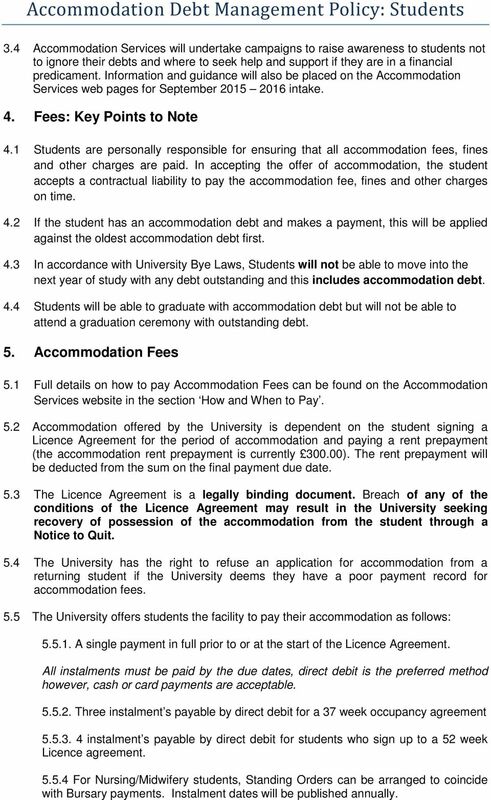 5.5 The University offers students the facility to pay their accommodation as follows: A single payment in full prior to or at the start of the Licence Agreement. All instalments must be paid by the due dates, direct debit is the preferred method however, cash or card payments are acceptable Three instalment s payable by direct debit for a 37 week occupancy agreement instalment s payable by direct debit for students who sign up to a 52 week Licence agreement For Nursing/Midwifery students, Standing Orders can be arranged to coincide with Bursary payments. Instalment dates will be published annually. 4 5.6 Students who have not paid their accommodation fees by the due dates will be subject to the debt management procedures detailed in Section 8 below. 6. Payment Default Charges 6.1 The University will levy additional charges for the non-payment of debt. The University is sympathetic where there is a genuine problem and students are strongly advised to keep Finance staff and Accommodation Services informed of any difficulties. 6.2 An additional charge of 200 will be levied against the student account if they default on paying one of the three accommodation instalments. Upon the charge being allocated the debt will be referred to the external debt collection agency. If a student fails to pay more than one instalment, only one charge of 200 will be allocated and the additional outstanding monies will be added to the debt being chased. 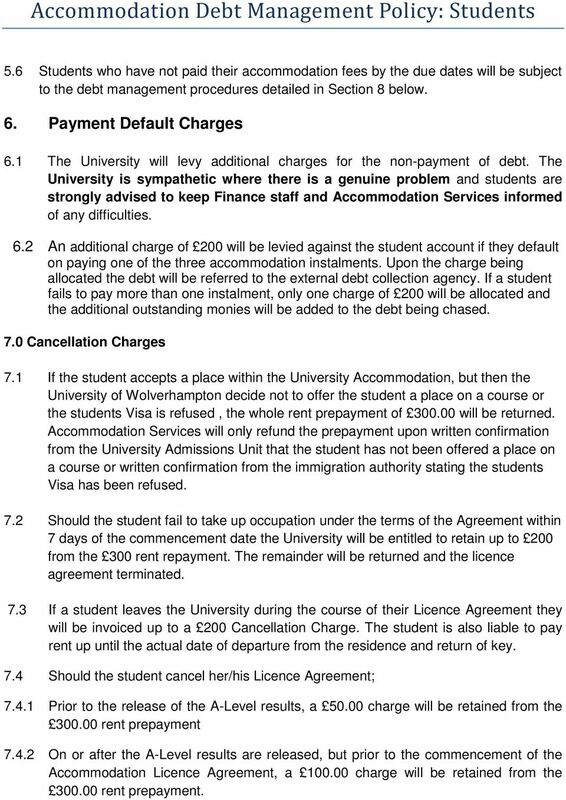 7.0 Cancellation Charges 7.1 If the student accepts a place within the University Accommodation, but then the University of Wolverhampton decide not to offer the student a place on a course or the students Visa is refused, the whole rent prepayment of will be returned. Accommodation Services will only refund the prepayment upon written confirmation from the University Admissions Unit that the student has not been offered a place on a course or written confirmation from the immigration authority stating the students Visa has been refused. 7.2 Should the student fail to take up occupation under the terms of the Agreement within 7 days of the commencement date the University will be entitled to retain up to 200 from the 300 rent repayment. The remainder will be returned and the licence agreement terminated. 7.3 If a student leaves the University during the course of their Licence Agreement they will be invoiced up to a 200 Cancellation Charge. The student is also liable to pay rent up until the actual date of departure from the residence and return of key. 7.4 Should the student cancel her/his Licence Agreement; Prior to the release of the A-Level results, a charge will be retained from the rent prepayment On or after the A-Level results are released, but prior to the commencement of the Accommodation Licence Agreement, a charge will be retained from the rent prepayment. 5 8. 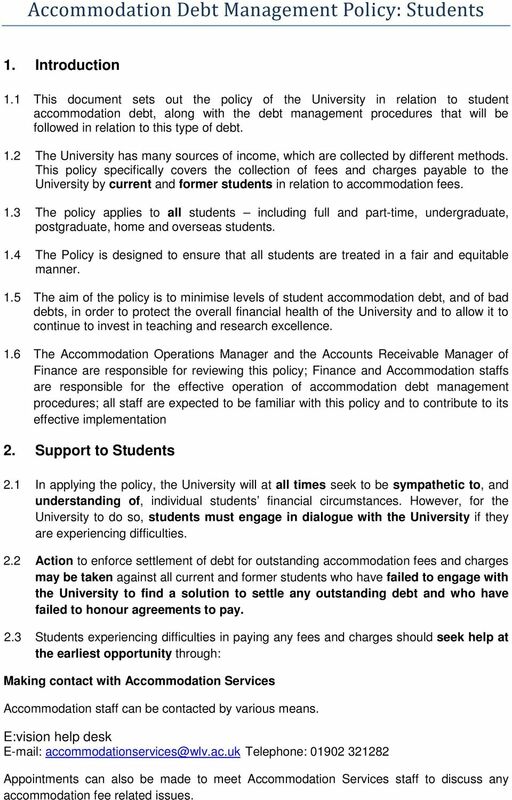 Accommodation Debt Management Procedures 8.1 If any student falls into arrears with any fees or charges, the University will take the following steps to recover the debt. 8.2 Accommodation fees Instalment One & Semester 1 Due date 28 th October 2015 Day 0 28 th October 2015 Instalment One due date 28 th October 2015 Invoices due to be paid and direct debits will be posted. Day 1 29 th October 2015 Finance to send first reminder giving 7 days to make payment. Any rejected direct debit will be represented on the 4 th November 2015 Day 8 5 th Nov 2015 Finance to send second reminder stating they have until day 15 to pay Day th October - 12 th Nov 2015 Accommodation Services and SU to undertake interviews at students request regarding financial circumstances, e.g. loan delayed or if a student requires a repayment plan to be set up to start repaying debt. Either Finance or Accommodation Service will set up the payment plan with the student. Notes regarding interviews or repayment plans are to be made on the students KX and Financial account. Finance will make telephone calls to debtors to chase payments and identify and reasons for delay in payments. Day th Nov 2015 Finance to send third reminder to state that if no payment plans have been set up and or students have not made contact with either SU, Finance or Accommodation Services the debt will be referred to STA after the reminder process for instalment 2 and the 200 referral charge will be raised against the students account Semester One only debt recovery Day 1 14 th January 2016 Accommodation Services will compile a list of all semester 1 students that have an outstanding debt as at 14th January Where students have not paid the semester 1 fee the 200 STA charge will be raised against the student account and the paperwork will be collated for the debt to be referred to STA. Instalment Two Due date 13 th January 2016 Day 0 13 th January 2016 Invoices due to be paid and direct debits will be posted. Day 1 14 th January 2016 Instalment two Finance to send the first reminder letter to students that have defaulted on instalment two payment giving 7 days to make payment Any rejected direct debit will be represented on the 20th January 2016 Day 8 21 st January 2016 Instalment two Finance to send second stating they have until day 15 to pay Day th January 28 th January 2016 Instalment two Accommodation Services and SU to undertake interviews at students request regarding financial circumstances, e.g. loan delayed or if a student requires a repayment plan to be set up to start repaying debt. Either Finance or Accommodation Service will set up the payment plan with the student. Notes regarding interviews or repayment plans are to be made on the students KX and Financial account. Finance will make telephone calls to debtors to chase payments and identify and reasons for delay in payments. 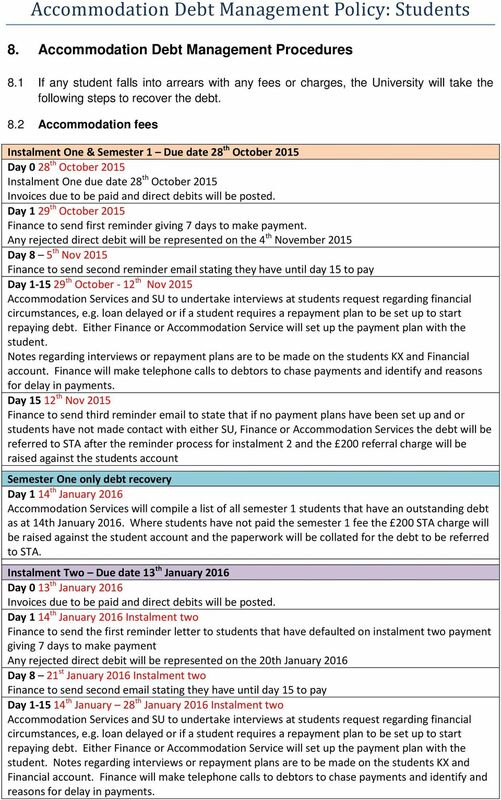 6 Day th January 1 st February 2016 Instalment two debt only Finance to send out third reminder to state that if no payment plans have been set up, students have not made contact with either SU or Accommodation Services the debt will be referred to STA from the week commencing the 8 th February 2016 and the 200 referral charge will be raised against the students account Note: if student has not paid instalment one and two only one 200 will be allocated against the account Instalment One and Two Debt Recovery Week commencing the 8th February 2016 Accommodation Services will compile a list of all students that have outstanding debt whether this is instalment one, instalment two or both instalments. Where students have not paid, the STA charge will be raised against the students account and the paperwork will be collated for the information to be referred to STA. Semester Two Instalment Due date 22 nd February 2016 Day 0 22 nd February 2016 Invoices due to be paid. Day 1 23 rd February 2016 Finance to send the first reminder letter to students that have defaulted on the semester 2 payment giving 7 days to make payment Day 8 1 st March 2016 Finance to send second stating they have until day 15 to pay Day rd February 8 th March 2016 Accommodation Services and SU to undertake interviews at students request regarding financial circumstances, e.g. loan delayed or if a student requires a repayment plan to be set up to start repaying debt. Either Finance or Accommodation Service will set up the payment plan with the student. Notes regarding interviews or repayment plans are to be made on the students KX and Financial account. Finance will make telephone calls to debtors to chase payments and identify and reasons for delay in payments. 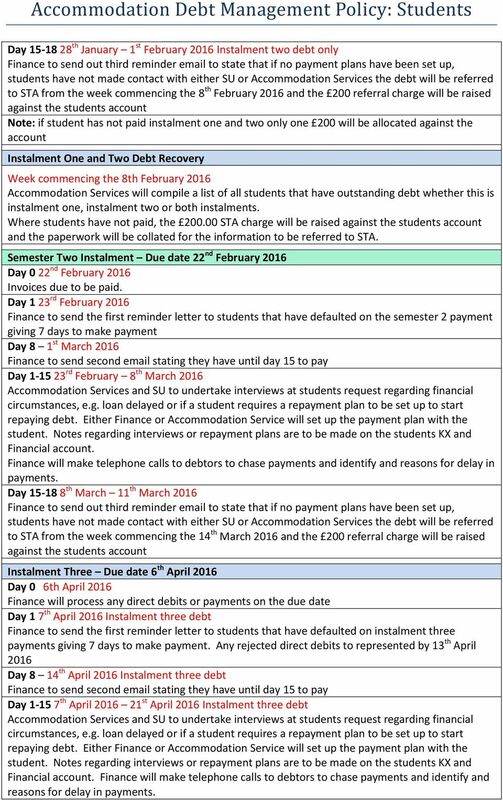 Day th March 11 th March 2016 Finance to send out third reminder to state that if no payment plans have been set up, students have not made contact with either SU or Accommodation Services the debt will be referred to STA from the week commencing the 14 th March 2016 and the 200 referral charge will be raised against the students account Instalment Three Due date 6 th April 2016 Day 0 6th April 2016 Finance will process any direct debits or payments on the due date Day 1 7 th April 2016 Instalment three debt Finance to send the first reminder letter to students that have defaulted on instalment three payments giving 7 days to make payment. Any rejected direct debits to represented by 13 th April 2016 Day 8 14 th April 2016 Instalment three debt Finance to send second stating they have until day 15 to pay Day th April st April 2016 Instalment three debt Accommodation Services and SU to undertake interviews at students request regarding financial circumstances, e.g. loan delayed or if a student requires a repayment plan to be set up to start repaying debt. Either Finance or Accommodation Service will set up the payment plan with the student. Notes regarding interviews or repayment plans are to be made on the students KX and Financial account. Finance will make telephone calls to debtors to chase payments and identify and reasons for delay in payments. 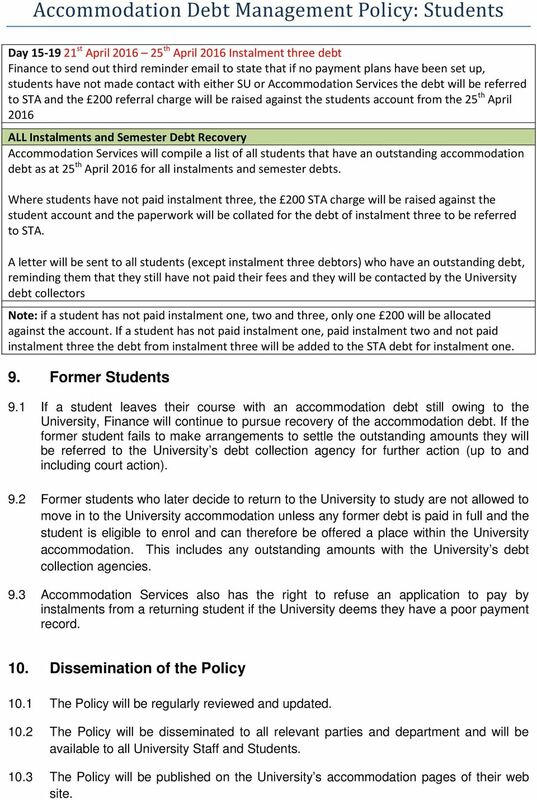 7 Day st April th April 2016 Instalment three debt Finance to send out third reminder to state that if no payment plans have been set up, students have not made contact with either SU or Accommodation Services the debt will be referred to STA and the 200 referral charge will be raised against the students account from the 25 th April 2016 ALL Instalments and Semester Debt Recovery Accommodation Services will compile a list of all students that have an outstanding accommodation debt as at 25 th April 2016 for all instalments and semester debts. Where students have not paid instalment three, the 200 STA charge will be raised against the student account and the paperwork will be collated for the debt of instalment three to be referred to STA. A letter will be sent to all students (except instalment three debtors) who have an outstanding debt, reminding them that they still have not paid their fees and they will be contacted by the University debt collectors Note: if a student has not paid instalment one, two and three, only one 200 will be allocated against the account. If a student has not paid instalment one, paid instalment two and not paid instalment three the debt from instalment three will be added to the STA debt for instalment one. 9. Former Students 9.1 If a student leaves their course with an accommodation debt still owing to the University, Finance will continue to pursue recovery of the accommodation debt. If the former student fails to make arrangements to settle the outstanding amounts they will be referred to the University s debt collection agency for further action (up to and including court action). 9.2 Former students who later decide to return to the University to study are not allowed to move in to the University accommodation unless any former debt is paid in full and the student is eligible to enrol and can therefore be offered a place within the University accommodation. This includes any outstanding amounts with the University s debt collection agencies. 9.3 Accommodation Services also has the right to refuse an application to pay by instalments from a returning student if the University deems they have a poor payment record. 10. Dissemination of the Policy 10.1 The Policy will be regularly reviewed and updated The Policy will be disseminated to all relevant parties and department and will be available to all University Staff and Students The Policy will be published on the University s accommodation pages of their web site.